FiCOM allows you to perform complete diagnostics of all 1996-present models. Diagnostics is performed via OBD-II connector (which is located near steering wheel) or via manufacturer-specific connector (only older cars, pre-2001). 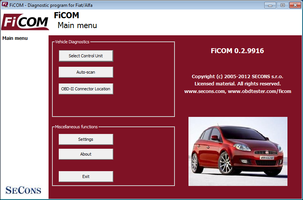 You can order FiCOM from our sister website www.obdtester.com/ficom for $379 or € 299. Learn more about Fiat original scantool: Fiat Examiner Smart.